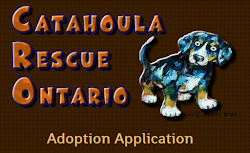 Catahoula Rescue-Ontario: Meet Cutter ADOPTED! Hi I'm Cutter! I am about 8 months old. I’m a fun loving, goofy, all around nice guy - just a big puppy. My foster brother and sisters think I'm great to play with, heck even the cats don't mind me (much)! I never have accidents in the house or my crate and I've learnt "sit", I'm still working on "down" and the rest of those words my foster parents use. I'm also working on learning my manners. My foster parents are still trying to get me used to walking on a leash beside them. I have to admit though that I am very afraid of cars and loud noises. When I hear loud, sudden noises or there are too many cars I just want to run and hide so you'll have to be patient with me and give me time to feel comfortable with that stuff. I come pretty quickly when called and I love to play with balls (but I'm still learning to share). Oh and I love water! I love love love to play in the water and go swimming! I generally like all people but I am happiest if you approach me slowly and give me a chance to sniff you (I wouldn't snap... I am just a bit shy). Sometimes my foster mom say's I get a bit carried away when I am excited and having fun playing. I get mixed up sometimes and don't remember that I need to play differently with people so sometimes I "puppy mouth". It's not biting, it's not hard but my mom and dad think I'm better off with older kids right now. My foster mom thinks I'm a total sweetheart and would make a wonderful family pet! 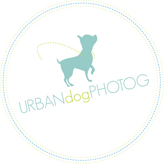 She say's I am kind and respectful towards the other dogs and cats that live here too. But, I am young and I am BIG and I am still learning, so I need people who are kind and patient and are willing to work with me and give me time to adjust. Cutter is neutered, up to date on vaccinations, heartworm tested (negative), and will be microchipped prior to adoption.